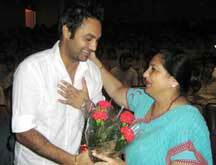 Amritsar 25th July ,Prabhjot Gill : Lakhinder Wadali, son of Puran Chand Wadali of the famed sufi singers Wadali brothers mesmerized audience with traditional folk and sufi songs at DAV Public School here today. Principal of School, Mrs Neera Sharma welcomed the singer at the special function in school.Singer Lakhwinder presented a fine blend of sufi classical music conjoined with contemporary music and mixed it with foot-tapping Bhangra numbers like ‘Weh mahiya tere vekhan nu nit charkha gali de which’ by Lakhwinder from his album Jogiya – The Ascetic. In addition to this he sang the famous number of Wadali Brothers ‘nit kher mangan soniya mein teri, dua nah koi hor mangdi…." The concert was also a promotional event to seek votes for Lakhwinder, a participant in TV talent hunt ”Junoon’ – Kuch Kar Dikhane Ka" on NDTV Imagine. The show has three competing teams named as ‘sufi ke Sultan’ –sufiana music, ‘Bollywood ka Badshah’—of popular cine music and "mati ke Laal " –popular folk music with the scent of the region . After some soothing Sufi and classical music, Lakhwinder rocked the evening with his Bhangra numbers and folk songs.